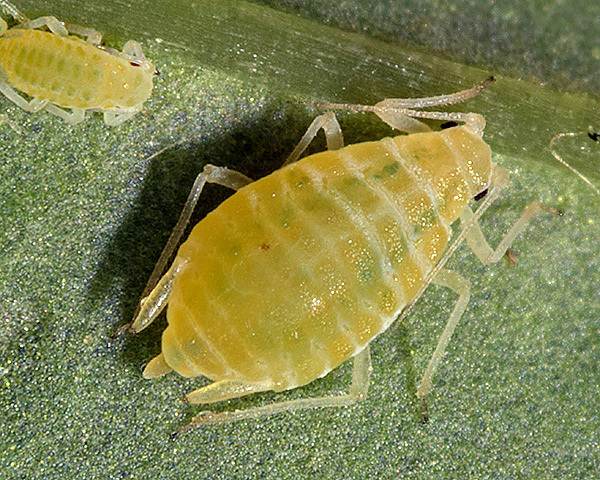 Liosomaphis are medium-sized aphids, the adult viviparae of which may be winged or wingless. The head is smooth, with the antennal tubercles weakly developed. The dorsum is unpigmented in viviparous females but with some pigmentation in winged forms. The siphunculi are markedly clavate (=club-shaped) and swollen, with the maximum width of the swollen part broader than the base. The cauda is tongue-shaped and longer than its basal width. There are 5 species in the Liosomaphis genus, all living on Barberry or Oregon grape (Berberidaceae). They retain a sexual stage in the life cycle but there is no host alternation. They are not attended by ants. One species is a pest of ornamental Berberis bushes. Liosomaphis berberidis apterae (see first picture below) are greenish yellow or reddish orange with a slight wax powdering. The antennae and legs are mostly pale, and the antennae are shorter than the body, about 0.4-0.5 times its length. The dorsum has no dark sclerites and is more or less distinctly wrinkled. The siphunculi are strongly swollen on the apical two thirds with a rather small flange, and are 1.8-2.3 times the length of the cauda. The cauda is thick and blunt. The body length of Liosomaphis berberidis apterae is 2.0-2.5 mm. The alate Liosomaphis berberidis (see second picture above) has the head, thorax, antennae and tips of legs darker than in the apterous viviparous female. Some tergites may have pale marginal and dorsal sclerites, sometimes fused into cross bands. 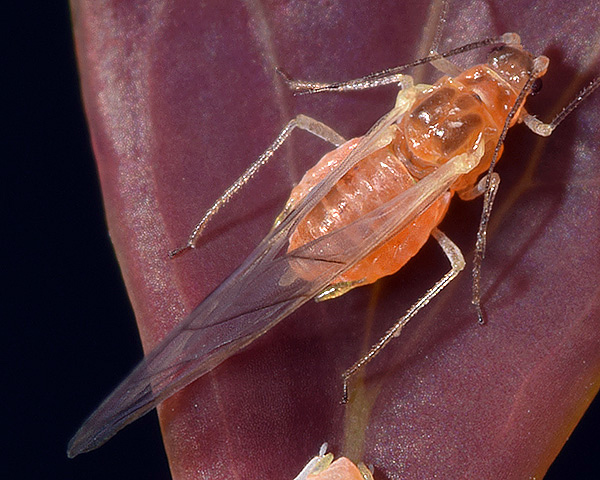 The barberry aphid does not host alternate and lives on the underside of leaves of barberry (Berberis) and Oregon grape (Mahonia aquifolia =Berberis aquifolium). It has a sexual stage in its life cycle. Liosomaphis berberidis is not attended by ants. It is widely distributed in Europe, Asia, North America and Australasia.